Designed around the seven phases of travel - Fly, Stay, Move, Eat, Work, Play and Rest, Zeno keeps business travelers connected with their organization's preferred suppliers from pick-up to drop-off. Supplier inventory can be accessed from any of the main Global Distribution Systems (GDS) as well as leading content aggregators across the globe. 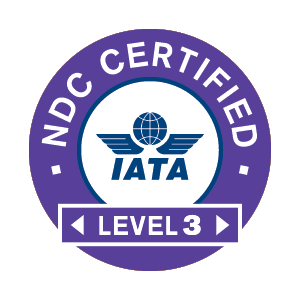 Zeno was the first travel and expense platform in the world to be certified NDC Level 3 by IATA. Supporting domestic and international itineraries, Zeno gives travelers the flexibility to find the right airline, fare and extras to suit their preferences - all within the boundaries of your travel policy of course. Find the perfect room for your travelers and your travel policy, with access to around 2 million hotel rooms that can be filtered by price, rating, location or brand. Your own corporate negotiated rates can be compared against other supplier rates to ensure you get the best rate of the day on every search, with access to additional availability when your preferred rate is sold out. All the major rental car providers can be booked through Zeno, with preferred options based on your corporate travel policy and traveler preferences. Zeno supports your travelers across their end to end itinerary, from pick-up to drop-off, with a range of options to suit budget guidance and travel requirements. Search and book train tickets or compare between train and plane with access to rail services across North America and Europe. You can even mix and match, booking a flight one way and train the other. Want to add your content to the Zeno marketplace?